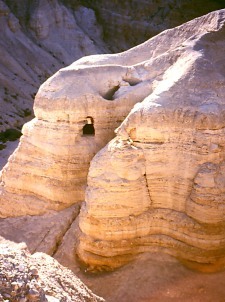 Rumor has it that the Dead Sea Scrolls contained a copy of Isaiah exactly matching the Isaiah found in our modern Bibles. The Isaiah Scroll Is Still Interesting! Note: I got this information from The International Standard Bible Encyclopedia, perhaps the most well-respected Bible encyclopedia there is. It's true that there was a report in 1947 that the Qumran (the caves where the scrolls were found) text of Isaiah matched the Masoretic text. It was retracted, however, in 1948. That means we've been circulating a false rumor for over six decades. Ouch. 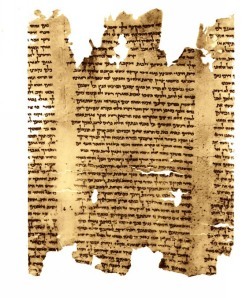 The scroll of Isaiah found at Qumran is a third text-type, matching neither the Septuagint (LXX) nor the Masoretic text. The Septuagint is a translation of the Hebrew Scriptures made over the course of a couple centuries just before the time of Christ. All of this is not that significant. All three text-types differ only slightly. It's Jeremiah that ought to catch our attention. Among the Qumran texts was a scroll of Jeremiah. This is very significant because the LXX version of Jeremiah is seven chapters shorter than the Masoretic, and what remains is in a different order! The Dead Sea Scrolls backs up the LXX version, not our Masoretic Bibles. We western Christians may worry about that, but eastern Christians won't. Most Orthodox Christians use the LXX for their Old Testament.